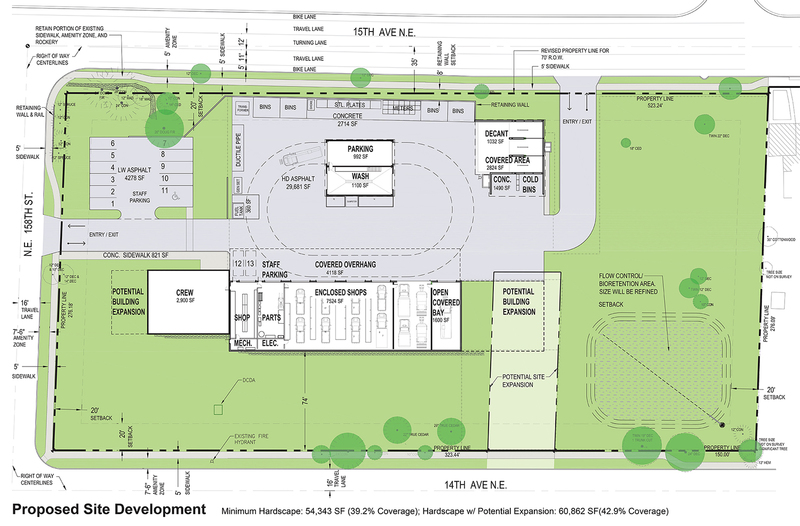 Site section drawing of our new Maintenance Facility on 15th Avenue Northeast in Shoreline. Graphics depict the site at full buildout. For years, North City Water District has been planning to upgrade and expand our Maintenance Facility, in our ongoing effort to provide safe, affordable water utility service within our rapidly-growing service area. The time is finally at hand. 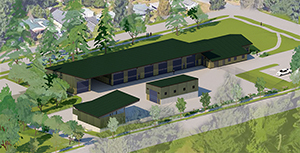 Our new Maintenance Facility will be built on a 3.2 acre site, located southwest of Hamlin Park at 15555 15th Avenue NE in Shoreline. April 9, 2019: Phase II Construction contract awarded to Faber Construction Corp.
March 12, 2019: issued request for construction bids for reduced project scope. February 14, 2019: no contractor was selected because all three construction bids were higher than expected; staff began working on options for either reducing project scope, or phasing the project over multiple years, to arrive at the facility we need within a reasonable budget and timeframe. February 12, 2019: Phase II Construction bids received. January 24 and 30, 2019: Pre-bid site visits for Phase II Construction. End of January: Phase I Site Preparation completion. January 8, 2019: Final Inspection, completion of the bioretention pond and Flexterra installation outstanding. Week of November 26, 2018: Expected completion of Phase I (site work), weather dependent. Mid November, 2018: Phase I continues: paving and some landscaping, weather dependent. Week of October 8, 2018: Phase I continues: curb, gutter and side walk installation begins. Week of August 20, 2018: Phase I continues: site grading and underground utilities installation (sewer, water, storm water electrical, gas and telecommunication). Week of August 6, 2018: Phase I begins: building and site demolition. Week of July 30, 2018: Asbestos removal is expected to be completed. July 9, 2018: Permits for the site development project were received from the City. Activities begin on site this same week, including tree preservation. June 18, 2018: 5 bids were receive for the first phase of the District’s new Maintenance Facility. New West Development out of Everett was the lowest bidder at $2,012,499 (excluding Washington state sales tax). May 1, 2018: District resubmitted plans for Site Development, Right of Way and Decant Building permit. April 12, 2018: District receives comments on the plans and begins to address them for resubmittal. February 20, 2018: District submits plans to the City of Shoreline for permits. December 19, 2017: our Board of Commissioners met and voted to adopt Tree Preservation Option C.
November 15, 2017: Public/Neighborhood Meeting – Minutes and Tree Preservation Options. A question was asked at the meeting about what precipitation information was used for this project. Our stormwater engineer is using 37.5 inches of annual rainfall for this project. August 15, 2017: Hearing Decision for Special Use Permit and Variance Request for Fence Height. April 25, 2017: Public / Neighborhood Meeting – Minutes and Presentation. Images are shown at full buildout. This is where vactor truck spoils are discharged. The vactor is used to excavate around water pipe breaks; the excavated soils are a watery consistency, like milkshakes. The decant building separates the water from the solids. We may construct this building in the future, to ensure District vehicles can be fueled in the event of a natural disaster; it will be covered by an open canopy. An adjacent standby generator will provide power to the entire site, it will be secured with a weather and sound enclosure. 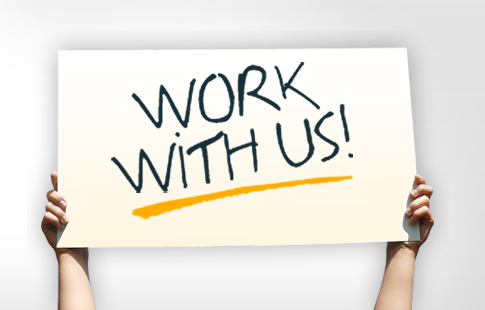 In order to keep financing costs as low as possible, we pursued bond financing. When the interest rates dropped in the summer of 2016, we had our bond rating reviewed by Moody’s Investors Service: they confirmed our outstanding operations with an ongoing Aa3 Bond Rating as of October 25, 2016. With such a great rating, we went to the bond market and on November 2, 2016, sold $7.685 million dollars of 30 year revenue bonds which will be applied to this maintenance building as well as other capital improvement projects. Mid-1940s: the site of North City Water District (NCWD)’s current maintenance facility (located at the intersection of NE 169th Street and 15th Avenue NE in Shoreline), was also home to our administration operations. During the next 30 years as our service area grew, we outgrew both spaces, and began exploring other parcels. 1996: NCWD purchased an old bank branch building located at 1519 NE 177th Street in Shoreline and converted it into affordable Administrative Operations space. The Maintenance Facility remained at its same location (169th and 15th). 1997: NCWD and the Shoreline School District jointly purchased roughly 20 acres at 23rd Avenue NE and NE 150th Street, known as the South Woods property, from the Department of Natural Resources. We split the cost, and divided up the parcels so that each District (Water and School) could meet their needs. Our intent was to eventually consolidate by locating three new facilities on this site: a new Administrative Operations Facility, a new Maintenance Facility, and a new Water Treatment facility. 2005-2006: the City of Shoreline passed a Parks Bond measure; at the City’s urging, we sold our South Woods parcel to the City so they could convert it into a park with trails. 2010-2012: the old bank branch building that we had converted into our Administrative Operations building was showing significant signs of failure. While performing a study to ascertain the problems and solutions, we also explored the idea of combining both Administrative Operations and Maintenance Facility on the same site. This combination required significantly more land, which we attempted to obtain, but were unsuccessful, so we proceeded with the Administrative Building renovation only. Meanwhile we explored several options for meeting the ever-growing Maintenance Facility needs, including 1) expanding and remodeling the existing site; 2) attempting to co-locate with another District or Agency at another location; or 3) purchasing or leasing a larger property. Option 1 was not feasible, as the existing site did not provide good turning radius for some of the larger District vehicles, and could not be expanded enough to meet our current and future needs for equipment storage, work space, a back-up generator, and adequate crew space. Option 2 was attempted with the City of Shoreline at Brugger’s Bog, but final arrangements were unsuccessful. This left us with Option 3. 2013-2014: after exploring several different sites, The Northwest Church’s property came up for sale in the summer of 2013. We conducted a preliminary site and building analysis and determined this was the best possible location for our new Maintenance Facility: it was conveniently located near the District’s main Administration Office, the site was amply sized to accommodate our needs, it had little or no use restrictions (such as wetlands or steep slopes), and the site featured two ingress/egress points which would allow larger vehicles to access the site with ease. We purchased the 3.2 acre site from the church in February 2014 for $3.3 million dollars. 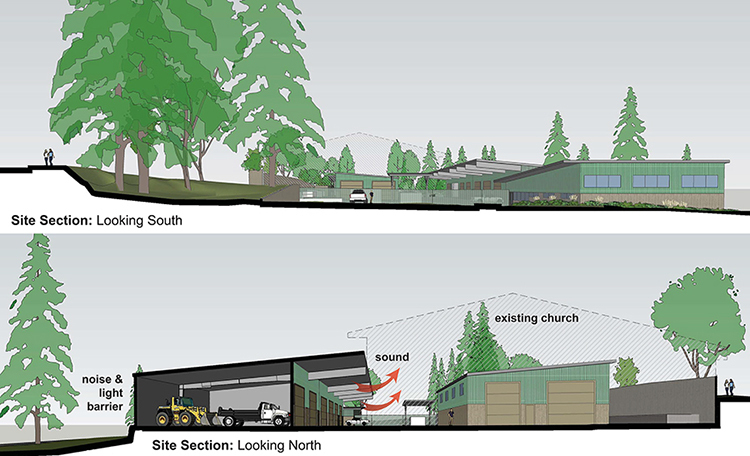 2014-2016: The Northwest Church began renovating their new facility on Scriber Road in Lynnwood, while still using their existing site for services. Once their renovation was complete and the church moved to their new home, North City Water District conducted a more in-depth study to determine whether we should reuse the church’s existing structures, or remove and replace them with a more energy efficient facility. It soon became apparent that the existing structures were too big for our needs, which would cost more for us to convert, as well as to maintain over the life cycle of the site. In September 2016, after a formal Request for Qualification process, the District selected Wagner Architects to help us redesign the site for our maintenance facility. 2017: we’ve held Public / Neighborhood Meetings in April and November to gather input and opinions about the site’s development, and look forward to working with our neighbors in the upcoming year as we further refine the vision for our site.